When you’re faced with multiple limitations–time, cooking experience, ingredients–cooking simply, quickly, and healthfully can seem a bit overwhelming. Well, have no fear: roasting to the rescue! Roasting is quite possibly the simplest form of cooking (besides, perhaps, the microwave method) and is one of the best ways to make sure all of the fresh vegetables in your refrigerator get eaten before they go bad. The most basic roasted vegetable recipes only require a baking tray, chopped vegetables, olive oil, salt, and pepper. Not at all intimidating, totally affordable, and only requires the ability to use a knife and work an oven. Chrysanthe is a senior at Smith College who shares an off-campus apartment with her best friend. To unwind, she enjoys long walks, bad television, good beer, and most of all a gin and tonic. Chop any vegetable you would like into bite-sized pieces. On a baking tray, evenly spread out the chopped vegetables. You may choose to first line the tray with tin foil, which will make for faster clean up. Drizzle olive oil on top and toss to evenly coat the vegetables. Sprinkle salt and pepper over the vegetables as desired. Place tray in oven and let bake for 20-25 minutes. Voila! Just like that, you have a delicious and nutritious side dish. If you have any herbs or spices that you would like to add to your veggies to give them more flavor, feel free to do so. Roasting vegetables is the perfect opportunity to get creative with ingredients you may have lurking in the pantry. But you don’t have to stop there. 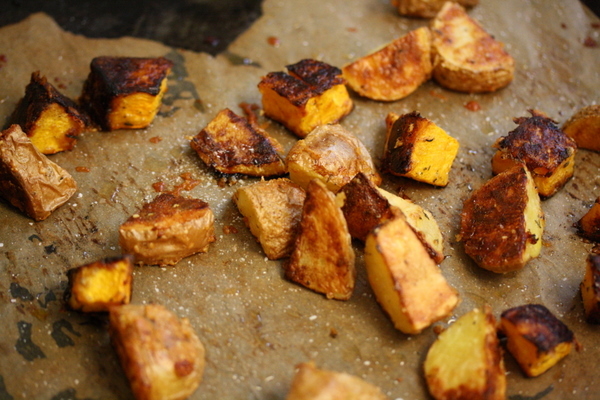 Roasted vegetables can become the basis of a complete meal. For instance, you may choose to add some cubed, seasoned tofu to the baking tray and serve the cooked veggies and tofu over some rice or pasta. Add roasted veggies to greens and goat cheese to bulk up your dinner salad. Roasted vegetables also speed up the already quick process of making a wonderful minestrone. Instead of waiting for the vegetables to boil in the chicken and vegetable stock, by simply adding the roasted vegetables and leftover pasta to the stock, you can have a fast and flavorful meal ready in no time at all.